Newly sworn-in Mayor Rahm Emanuel announced a deal with aldermen last week that he said would bring much-needed reform and efficiency to the Chicago City Council: The number of legislative committees would be cut from 19 to 16, trimming about $500,000 from the council's $20 million annual budget. "The people of Chicago were loud and clear when they voted for change and that is exactly what we are announcing today," Emanuel said. "This City Council reorganization provides relief to taxpayers by reducing cost and increasing efficiency." But the proposal doesn't address what many reform advocates say is a much bigger and more costly issue: the fact that Chicago's legislative branch doesn't really do much legislating. Not, at least, the sort of legislating that consists of drafting, debating, and passing laws that have a broad impact on the public policy of the city. For much of the Daley era, the City Council was ridiculed as little more than a rubber stamp, ready and willing to sign off on whatever legislation the mayor was pushing. But that's not the full story. Aldermen have actually spent far more of their time signing off on routine administrative and clerical measures that might be better handled by other city departments—things like new traffic signage, residential parking restrictions, and permit renewals for business signs and sidewalk cafes. The 50 aldermen each earn between $104,000 and $110,000 a year. "The day is going to come when routine matters like a canopy approval or a parking issue will be dealt with administratively," said Miguel del Valle, the city clerk from 2006 until last week. "I understand aldermen want to keep a handle on these things, but you can do that another way." Under current law, each of these items is governed by a separate city ordinance, but del Valle and some aldermen believe that many if not all of them could be processed more efficiently by city offices that already work on the same issues, such as the building or transportation departments. It's not clear where the new mayor stands. When asked for a comment, mayoral spokeswoman Tarrah Cooper re-sent a copy of his statement touting the committee reorganization plan. 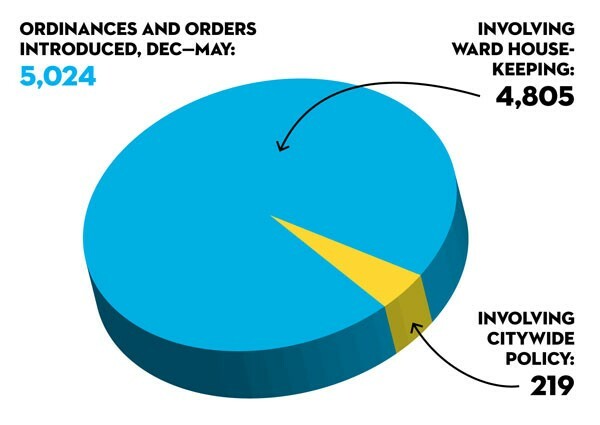 Data drawn from a legislative tracking system launched last December on the City Clerk's website show how often aldermen propose and pass such legislation—and how infrequently they address larger issues. In the five months between the launch of the tracking system and the last meeting of former Mayor Daley and the old City Council on May 4, the mayor, city clerk, and 47 aldermen who served for the duration of that time introduced 5,024 ordinances and orders. Of them, just 219, or 4 percent, involved public policy beyond permit renewals, sign approvals, and other ward-level matters. So far 3,298, or about 66 percent of the total, have passed. All but two passed unanimously. The data also show that few aldermen regularly act as citywide legislators. The city's chief executive, Mayor Daley, was the leading policy lawmaker, sponsoring or cosponsoring 125 of the 219 citywide and policy issues. Most of Daley's ordinances were citywide administrative matters that only the mayor would be expected to take the lead on, such as the city's annual budget and agreements with other governmental bodies like the CTA. But others weren't. Those initiatives illustrate how Daley dominated the council's policy agenda, affixing his name atop ordinances passed by the council that govern construction debris recycling, shared kitchens, and the use of tax increment financing funds for affordable housing—the latter an initiative Daley took credit for after it had been pushed for months by a coalition of aldermen and activists. He was followed by 14th Ward alderman Ed Burke, who as chairman of the council's finance committee sponsored 32 citywide ordinances, most of them regarding monetary matters such as the payment of medical bills for police and firefighters injured on duty. There was a steep drop after that: The next most active citywide legislators were del Valle, with 11, including five designating historical landmarks; and, with six apiece, Danny Solis (25th Ward), Ray Suarez (31st), Patrick O'Connor (40th), and Virginia Rugai (19th-retired), who as committee chairmen helped shepherd Daley's proposals through the council. Alderman Brendan Reilly led another category: he had the highest total of all ordinance sponsorships, with 595. All but four dealt with parking, business signs, valet parking zones, and other permitting issues in the 42nd Ward, which includes much of the Loop and Gold Coast. "Usually on any given council meeting I'm staring at a foot-and-a-half to two-foot pile of paperwork," he said. "These permits include things as routine as a sidewalk cafe application, but they can be as big as a major street closure for a construction project. If anything goes wrong with one of those permit requests, I can assure you that the first person to get a phone call is the local alderman." Reilly said he has formed a "working group" with several other aldermen to find ways to streamline the permit approval process. Permit and license renewals, for example, could be automated, which he said would reduce inefficiency in the legislative system while helping businesses. "Absolutely the city can do more to cut down the bureaucracy," he said. This kind of talk makes Anthony Beale a bit nervous. "We also have to be careful and make sure we don't give up aldermanic rights and privileges," said Beale, alderman of the struggling Ninth Ward on the far south side. Beale ranked last in the total number of sponsored ordinances with 21. All but five addressed permits and other ward housekeeping, but he said such matters "impact the lives of residents." "The people elect us to have their voice in the City Council, and if you want to constantly take that right away from the public officials, then you're going to dilute their voices in the City Council," he said. Rookie 47th Ward alderman Ameya Pawar said the current system appears to be in place more for good politics than sound policy. "The attitude is that 'We're not going to interfere in what's happening in your ward as long as you don't interfere in what's happening in my ward,'" he said. "If you take that view, you're never going to get rid of these fiefdoms." , and inductees into the Irish American Hall of Fame. All of this would be much harder to follow without the new legislative tracking system, which del Valle considers one of his signature accomplishments as clerk—and a major step toward transparency at City Hall. He notes that when Daley appointed him in 2006, some of the office staffers were still using electronic typewriters. "I feel like a guy who bought an old antique clunker and fixed it up," he said, "and now I'm giving it away." E-mail Mick Dumke at mdumke@chicagoreader.com.